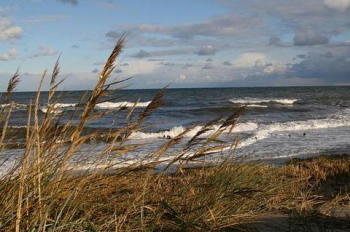 Feel the fresh wind of the Baltic Sea in your hair! The German-Polish part of the East Baltic coast is not the only destination on a cruise on the high seas: river cruises will also introduce you to some of the pearls of these waters, both large and small. These voyages will bring you face-to-face with a synthesis of history and the present day, along with a landscape of manifold charms. Whilst it is true that the Baltic stretches from the east coast of Germany right up to Scandinavia to the north, for the purposes of of a Baltic Coastal River Cruise, we are particularly interested in the stretch of coastline which takes in the coast of Mecklenburg-Vorpommern and the adjacent part of the Polish coast. The best time for a Baltic Coastal River Cruise is between May and September. Since 1945 the Stettiner Haff has been part of the border between Poland and Germany. On the Polish side you find the city of Szczecin (German: Stettin), which is one of the most impressive destinations on a Baltic Coastal River Cruise. The city lies on the Oder estuary where it discharges into the Stettiner Haff and is one of the Baltic&apos;s largest ports. The cityscape is divided between the old town, with its Gothic church of St. James and the castle of the Dukes of Pomerania on the one side, and the new town, home to the actual city centre, on the other. Here it is that the magnificent buildings of the Wilhelminian era blend with contemporary structures and bear witness to Szczecin&apos;s colourful history. Also to be found on the Polish side of the Stettiner Haff is the island of Wollin with its fantastic beaches. This island is home to a town of the same name, with a charming little centre and small port. The attractions here include the cathedral of St. Nicholas, a 13th century Gothic brick structure with a nave and two aisles. On the German side, one of the destinations of a Baltic Coastal River Cruise is Wolgast on the western bank of the Peene. The medieval town centre boasts the attractive 14th century church of St. Peter. The Peene separates the small island of Usedom from the mainland. This island is home to the small parish of Peenemünde, which is the island&apos;s northernmost point. The old Hanseatic city of Stralsund is known as the gateway to the island of Rügen. Large sums of money have in recent years been spent on restoring the city, which is now thoroughly worth a visit. It is above all the cluster of attractive buildings on the "Alter Markt" which testify to the glory days of commerce. The island of Rügen itself is home to Lauterbach, which is used as a port for the cruises. Vitte is the largest and most central settlement on the island of Hiddensee, which lies to the west of Rügen. The Zingst peninsula is a sea spa, also interesting on account of its chequered history. Discover the charm of the north on a Baltic Coastal River Cruise. Experience Hanseatic tradition and a maritime flair which will delight you.